The opportunities to buy leather in Florence are vast, from luxury boutiques, to raucous street bazaars, to “private” workshops, to sidewalk trinket sellers. To make matters more confusing, things are rarely what they seem on the surface. You can find a reasonably priced bag on the street whose quality equals an item in a high-end boutique. Other times, the same merchant may sell the same bag in a pelletteria and also in a market stall, at two very different prices. Some pieces are made on an industrial scale, others on an artisanal one, and sometimes the same merchant may sell both. In short, leather shopping in Florence can be very tricky. If you’re serious about going home with a quality leather souvenir, you should know a few tricks of the Florentine leather-shopping trade. First, if you can buy directly from the maker, that’s the absolute best guarantee of knowing exactly what you’re buying. However, in Florence buying leather directly from an artisan is only easy when buying small, portable items like boxes, wallets, and change purses. Most apparel items are sold in small retail shops. In this case, what you buy is more important than where you buy. Try to divorce the handbag or jacket from its setting if you can and focus instead on the quality of the individual piece. Aroma: When it comes to judging leather, follow your nose. The item should smell musky and natural. Steer clear of anything that smells like chemicals, which are used to treat the hides and cover up lesser quality. Your sense of smell and touch will help determine the quality of the leather. The more supple the leather feels, the better. If an acrid, chemical smell assaults you when you enter the shop, chances are the goods are heavily dyed to disguise lesser-quality bonded leather. A wonderful, earthy aroma characterizes natural leather. Suppleness: The leather should feel smooth, supple, and soft, not stiff. Color: The highest quality natural leather in tan or brown can stand on its own, without any added color, to reveal the natural grain and beauty of the material. Dyes, in red or green, for example, can mask lesser quality leather. If the edges of the leather are unfinished, you should be able to tell if the color lies on the surface or penetrates all the way through the hide. If you buy a blue bag, for example, you may only see blue on the surface, not in the middle. If that’s the case, chances are, this is bonded leather whose surface has been sprayed with dye, perhaps to resemble a grain-like “natural” pattern. Stitching and other details: The stitching should be tight and regular, with small stitches sewn close together. Silk or satin lining is used in higher-quality bags and apparel. The San Lorenzo market attracts leather-shopping visitors from Tokyo to Tulsa, with its pulsating rhythm, the chatter of bargaining merchants, the bustle of the crowd, and the musky aroma of leather wafting into the air. The market itself includes an indoor section known as the Mercato Centrale, which sells mostly food items, while the outdoor market is known for leather. You will not necessarily find the lowest prices or the best quality here, but I have still scored some good-quality finds, including a classic brown jacket I bought a decade ago that still looks great. Many of these street vendors also operate retail stores. Their street-side stalls are just another venue for generating sales, without the overhead of a shop. That’s how you might find the same item with two or more different prices. Another popular leather-shopping spot is the Mercato Nuovo, also known as the “porcellino” market for the bronze pig whose nose has been rubbed smooth by superstitious travelers to guarantee a future trip to Florence. During the Renaissance, wealthy Florentines shopped for gold and silk under the arcades of this beautiful marketplace. Later, it became known for straw vendors. Today, leather takes center stage in the Mercato Nuovo. As in the San Lorenzo market, quality and price vary widely. 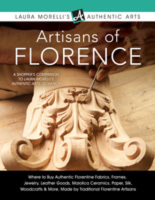 This is one of the trickiest places to shop in Florence, so be sure to use your skills of distinguishing higher from lower quality in order to ensure you make a purchase you’ll still be happy about when you get home. Whatever you do, do not buy a “brand name” handbag in Florence from someone selling it on a blanket spread out on the sidewalk. This advice may seem like common sense, but tantalizingly cheap prices lure visitors into this trap every day. For Italian authorities, this scam is considered serious business, as the brand-name leather trade is a major driver of the Italian economy. In recent decades, authorities have cracked down with greater force on vendors selling knockoff bags to buyers who either don’t know the difference or are more than happy with a low-priced imitation. I have seen women purchase handbags on the street, only to turn around and have to hand over the bags directly to uniformed carabinieri waiting for the transaction to close. These customers do not get their money back; it’s just not worth it. Bargaining is the norm in the markets and I have found that you can easily take off ten to twenty percent simply by asking, or by plying some tried-and-true haggling techniques such as offering to pay cash, buying more than one item at the same time, or just walking away. Talented hagglers might get the price down to half. In shops, bargaining is less common and usually less successful, but it never hurts to ask. One of the market vendors may extend you an “exclusive invitation” to visit their “private” leather workshop. Yes, these are mostly gimmicks geared toward making tourists think they’re getting the deal of a lifetime. Here’s how it works: You follow a high-pressure salesman (truthfully, it’s usually a charming, handsome Italian man) to an unmarked door down a side street. There you encounter a no-frills warehouse-type setting chock full of leather apparel, and perhaps a few more handsome Florentines. They’ll help you try on jackets before a mirror, all the while asking if all American women are as beautiful as you. Impressive sales tactics, no doubt. What you pay depends mostly on where you buy. I priced a popular type of medium-sized shoulder bag in several places around the city. A street vendor near Santa Croce carried the style I wanted and I bargained him down to about thirty-five percent off the original asking price, but the stitching was beginning to fray and the leather felt stiff, so I passed. A similarly styled bag in a high-end boutique near the Duomo—this one of great quality with soft leather, silk lining, and fine stitching—was exorbitantly priced. In the end, I found a winner, the quality equal to the higher-priced bag, in an unassuming boutique on a less-trafficked street. This experience is typical of Florentine leather shopping. Some visitors find the experience confusing or exasperating, while others relish the thrill of the hunt. As a general rule, Florentine leather goods are not cheap, but often represent a good value considering the quality. The safest bet is to buy directly from the maker and to focus on small, portable items—boxes, change purses, eyeglass cases, albums, desk accessories—rather than apparel, which is more complex and tricky to get right. Many of these small items are completely handmade on site, and the prices are typically reasonable. They also make durable souvenirs and special gifts that are either easy to transport in your suitcase or relatively simple to ship. Thanks for the great article, Laura! An old friend and I are renting an Airbnb apartment for two weeks in October in Pistoia, easy walking distance to the train station. We’ll be looking for the less-traveled paths in and around Florence, Pistoia, Lucca, and any place we can reach by train or bus. Any suggestions? 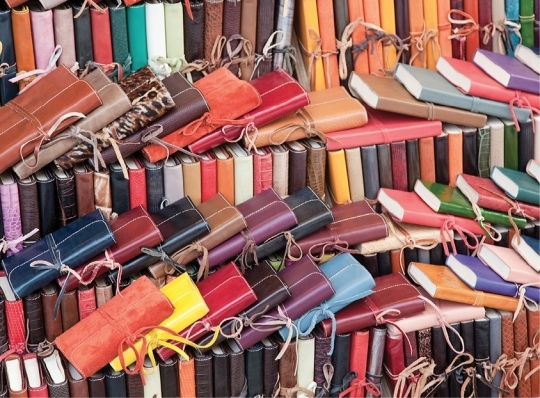 And which book of yours should I look for that focuses on Tuscany and Umbria? Grazie – ciao! Hi Kate, it sounds like you have a great trip planned! Check out Made in Florence here: https://lauramorelli.com/store/made-in-florence/. Have a wonderful time! You are very kind. Thank you so much! I’m thrilled that you enjoyed it! I got my purse in 2009 and I still use it today. I talked the salesperson down over 100 euro because I left and came back the next day. I loved the bag but I wasn’t going to pay the crazy price for it even though it was beautifully made. It was definitely the best buy of my trip. Agreed! I have a jacket I bought 25 years ago and it still looks beautiful! My first visit to Florence (there will be more!) was in 2009. I didn’t go searching for leather goods, but I happened onto a couple of great deals. One was a deep red patent-leather dome satchel and the other a purple and cream square satchel. I get endless comments on them both and I just love them. But one of my favorite finds on that trip was an umbrella. The canopy is navy with a navy-and-white floral second layer peaking from under the top. The pole is straight and the knob is set with matching navy “jewels.” I can’t wait to buy more umbrellas on my next trip. Purchased mine at the Leather School and it’s beautiful! Pricey, yes, but worth it. There is nothing like the leather that comes from Italy in the world. I still do not know how they can make it both soft yet durable. Not to mention incredibly fashionable. Thanks for the great article!! !